All but the smallest accountancies are seeing a number of challenges, from regulatory to technological. I want to highlight two that we’ve seen frequently. Those are complexity and cross-selling. The neat categories of “Assurance, tax and advisory” don’t come near to describing the variety of services most firms now offer: there are transactions services, risk services, technology consulting – and each of those sub-categories can be further broken into topics like cybersecurity, forensic services, bankruptcy, and so on. The typical mid-sized firm’s website will list about 25-50 areas of expertise. One issue this raises is intra-firm coordination and cooperation. How much do you focus on deep specialization vs. broad capabilities among your managers and partners? How do you coordinate among multi-specialty teams? How do you handle career paths? How do you market and sell a complex service offering? How do you manage and promote centers of excellence or practice areas? But service complexity has an even more important implication for business development: how do you convey multiple capabilities to a new client, and – especially – how do you explore new service offering opportunities in existing clients? This issue of course goes by the deceptively simple term ‘cross-selling’. This is an important issue for two reasons. First, the biggest driver of an accounting firm’s profitability is its cost of sales – and the lowest cost of sales come from repeat-client business. This means the ability to identify and communicate complex service offerings to existing clients is a critical (I would argue the critical) determinant of the firm’s economic health, including bonus pools. The other reason is personal and firm growth. A firm that manages itself as a series of silos is a firm that will slowly wither on the vine. Its people have no opportunities to grow and diversify; it exists on a steady diet of new clients in each practice area, each jealously guarding its ‘proprietary’ clients rather than risking the introduction of different practices into the relationship. The single biggest barrier to successful cross-selling is quite ironic – it is the firm’s own dedication to subject-matter mastery. Too many professionals have come to believe that the key to their success is becoming the go-to expert in their own area of mastery. The sad knock-on effect is that their preferred approach to cross-selling is the business-card handoff – “I’ll get you in touch with my partner, (s)he’s an expert in this area.” It rarely works. What does work is the willingness of the professional to wade in where they don’t have deep expertise, and to proactively focus on defining the problem, collaboratively with the client and with their own internal partners. Their role is not to be the expert – it is to be the client advocate, marshaling the resources of the firm in a hands-on manner. What does it take to behave this way? First and foremost, a comfort with ambiguity; a willingness to focus on problem definition, rather than on problem solutions. This can only happen in a firm whose partners and service leaders know how to trust each other. Trusting your partners not only opens up the firm’s capabilities for its clients – it creates much richer opportunities for the firm’s staff. It all starts with trust – in particular, the ability to say “I don’t know, but let’s talk this through,” and the willingness to engage proactively with one’s partners in service to client needs. Trust requires trustworthiness, to be sure; but it also requires the ability to trust others. This isn’t commonly taught, and doesn’t come natural to many. But it can be taught. We know how to do it. This is what we do – create trusted advisors. 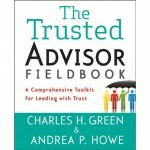 Trusted Advisor and Trust-Based Selling programs, such as Workshops, are aimed at this need. 60% of our work is done in various professional services clients, with consulting a heavy component.